Destiny Healing. Over 2000 Advanced Energy Workshops for Physical and Spiritual Evolution. Think with me for a moment. What is Destiny? Is your destiny just chance or is there some plan at work? 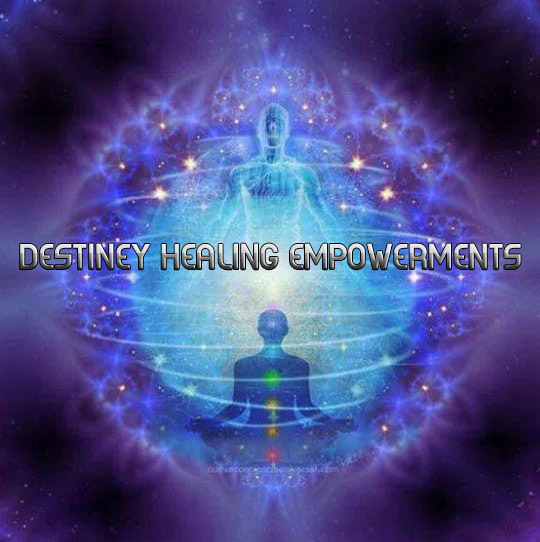 Destiny Healing Workshop's powerful Empowerments will help you balance your karma by its energetic effects! You will enjoy a happier more joyful life once you realize you are made in the image of God! By activating the proper Attunements and applying spiritual principles in your life, your life will become instantly happier and easier! Is your destiny preordained and happens according to an earlier master plan? Does your free will matter or is it something that is also preordained? Do you ever wonder if you're living the destiny you were meant to live? Do you ever wonder if you're on the right path? The nature of Destiny has been debated since the dawn of time. Some believe it is unchangeable, written in stone. Others believe Destiny is like a giant tapestry, made with the threads of our thoughts and emotions where each thread can be rewoven. Richard Bach said "Within each of us lies the power of our consent to health and sickness, to riches and poverty, to freedom and to slavery. It is we who control these, and not another." Upon a deeper reflection and practical experience, you will know, Your Destiny is dependant on your karma and your karma is dependant on your actions; dictated by your mental and emotional bodies. So we must learn to live according to the eternal rules of a divine life. We must improve the quality of our lives so we live in balance and peace and light! Your destiny is the divine journey that you are living right now. It may look different from what you imagined, but everything is perfectly planned! Once your mind and soul are cleansed of the disharmonies of unworthiness and unbelief, your mind will be transformed and your life will align with God. Your Destiny will be changed forever! Activating the Ascension Matrix Initiation, you will learn that; your spiritual Destiny is not something in the future, not something that you will attain at death but a beautiful Destiny that is happening now and that can be yours now! You will receive the Destiny Healing-Practitioner manual via Email, All Empowerments and a emailed certificate. Plus full email support is given before, during and after all my Workshops.